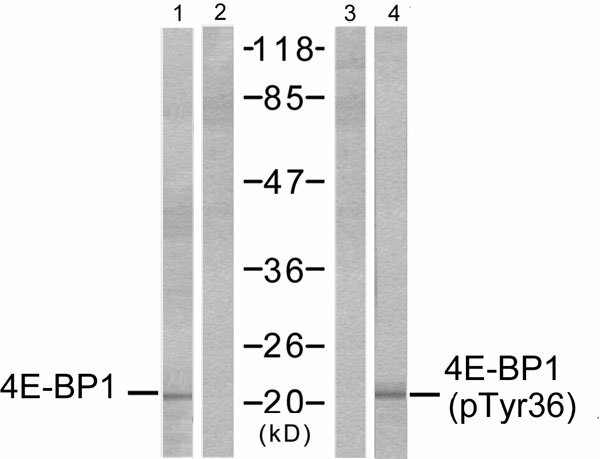 4E-BP1 (Ab-36) antibody detects endogenous levels of total 4E-BP1 protein. This antibody may cross-react with 4E-BP2 and 4E-BP3. The antiserum was produced against synthesized non-phosphopeptide derived from human 4E-BP1 around the phosphorylation site of threonine 36 (S-T-TP-P-G). 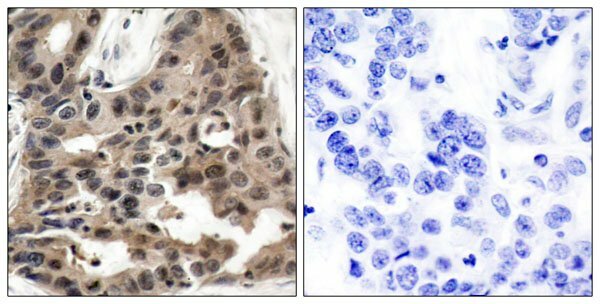 Peptide-+ Immunohistochemical analysis of paraffin-embedded human breast carcinoma tissue using 4E-BP1 (Ab-36) antibody. Western blot analysis of extracts from MDA-MB-435 cells, untreated or EGF-treated (200ng/ml, 30min), using 4E-BP1 (Ab-36) antibody (Line 1 and 2) and 4E-BP1 (phospho-Thr36) antibody (Line 3 and 4). Gingras AC, et al. Genes Dev Nov. 2005 Feb 15. Mothe-Satney I, et al. (2000) J Biol Chem:15(21): 2852-64. Gingras AC, et al. (1999) Genes Dev:13(11): 1422-37. Lal L, et al. (2005) Blood; 105(4): 1669-7.